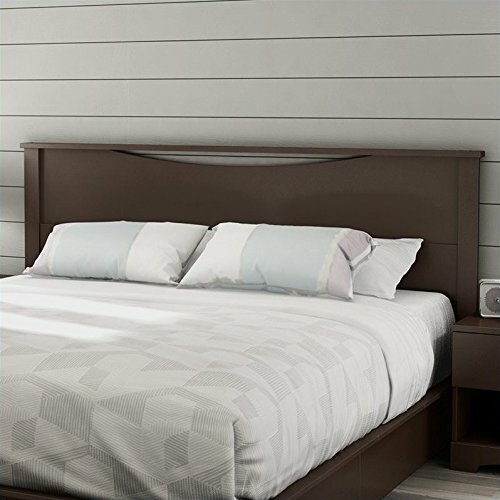 This Step One King Headboard in a Chocolate finish with its geometric lines and European-inspired style will add elegance to the bedroom. Designed to be attached to the Step One platform beds 3159237 or 3159248 for a complete kit, but can also be attached to a standard king (78") metal bed frame. Also available in Pure White or Pure Black finish. Measures 88-1/4-inch wide by 3-inch long by 44-inch high. Delivered in 1 box measuring 94-3/4 in. by 16-1/4 in. by 2-3/4 in. and weighing 60 lbs. The back surface is not laminated. Accessories not included. Manufactured from certified Environmentally Preferred laminated particle panels. Complete assembly required by 2 adults. Tools are not included. 5-year limited warranty. Made in Canada.